If you haven't experienced the power of flash charging, this Quick Charge 4+ will be like a parable to you. 6 Months ago, Qualcomm announced Quick charge 4.0, a notable feature of Snapdragon 835 chipset that allow a smartphone to go from 0% to 50% in just 15 minutes. But among the newly released smartphones of the season, like Galaxy s8, s8+, Sony Xperia XZ Premium, Xiaomi Mi 6, and HTC U11; none of them has Quick charge 4.0 support. 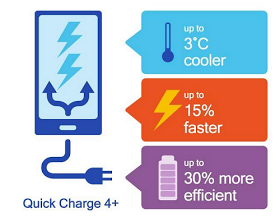 Quick Charge 4.0+ can charge a device up to 15% faster, and it's 30% more efficient when compared to Quick Charge 4.0. 1. Dual Charge: which is present in previous versions of the technology but is now stronger than even. With Dual Charge, the charge current will be divided allowing for lower thermal dissipation and reduced charge time (up to 15%). 2. Intelligent Thermal Balancing: This conducts current via the coolest path autonomously, thus eliminating hot spot for optimized power delivery. 3. Advanced Safety Feature: Quick Charge 4 already includes rigorous built-in safety protocols. Quick Charge 4+ goes one step further and is designed to monitor both the case and connector temperature levels simultaneously. This extra layer of protection helps ward against overheating and short-circuit or damage to the Type-C connector. With all the 3 features above incorporated into a device, that device has the potential to charge up to 15 percent faster, or 30 percent more efficiently when compared to Quick Charge 4. According to Qualcomm, the first smartphone to run Quick charge 4.0+ technology is the Nubia Z17, which was unveiled earlier this week. The handset comes with a 3,200 mAh battery, a Snapdragon 835 processor, as well as 8GB RAM and 128GB storage.